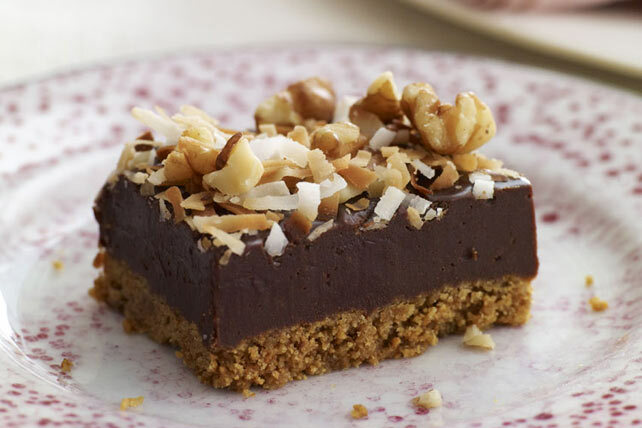 Warm, homemade fudge is poured over a graham cracker crumb crust, topped with walnuts and toasted coconut then chilled for no-bake dessert bars. Line 13x9-inch pan with parchment, with ends of parchment extending over sides; spray with cooking spray. Melt 3/4 cup butter; mix with graham crumbs until blended. Press onto bottom of prepared pan. Bring remaining butter, sugar, milk and marshmallows to boil in saucepan on medium heat, stirring constantly; cook and stir an additional 5 min. Remove from heat. Add chocolate; stir until chocolate is melted and mixture is well blended. Pour over crust. A portion, one bar, is all that is needed to provide big chocolate flavour.